So, you may or may not know that I live in Holland and as such, we have a tradition here to celebrate our King one day a year (on his birtday). And that day is today! I'm still not really used to it being called King's Day, as we used to have a Queen, and this is only the second King's Day. 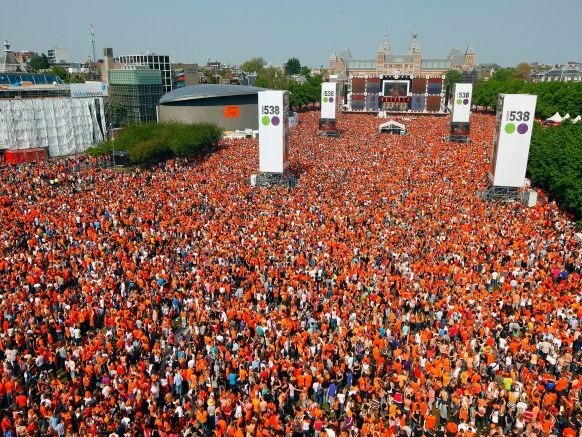 Basically, we all wear something that's either orange or red-white-blue (colours of our flag) and go out and party, the picture shown above is of one of the squares in Amsterdam. I'm probably not joining in this year, but most of Holland goes a little crazy during this day, with food and drinks in style if you want. There are kids and adults selling stuff they don't want anymore, sorta like a garage sail, only in squares and such. There was just a parade of decorated bicycles in my street and all sorts of games being organised. Basically, EVERYTHING is orange today. What are some traditions or special holidays where you live? Biggest holiday celebrated here is St. Patrick's Day, more than a half million people flock into Savannah to party. Hurray, staying in and working Dutchies unite! ;). I usually celebrate as well though, especially when I was younger and my brothers and I would sit on the 'kleedjesmarkt'. Now I'm older the very-drunk-people-in-orange don't seem so appealing anymore. Amazing amount of orange. Congratulations.